Finally a flexible and affordable mobile to VoIP (Skype and SIP) bridge service was launched at the beginning of this year. As opposed to other similar services, this is the first one focused on simplicity and customization. Although it is marketed as a mobile to VoIP bridge service, you can use it with almost any classical phone. All you have to do is dial a local access number (or a toll-free number), and after the system recognize your CallerId, type your abroad number. The interesting part is that you choose the rates by registering your preferred VoIP providers with this service. All your calls will be routed through one of your registered providers according to a dial plan you define. This is the registration page for you providers. For maximum convenience, you can register more than one account with the same provider. Note that the service doesn’t actually register with SIP proxies because most people have also ATAs at home that use the same service. The following screen is the one where you define you dialing plan. You basically need to specify just a prefix for each account that you want to use. While on the road, call a local PSTN access number, then your destination number beginning with the prefix for the appropriate account. For even a simpler way to call abroad family and friends, the service offer the ability to define personal local numbers for those contacts. Just add these numbers to your phone’s address book and you are ready to call. 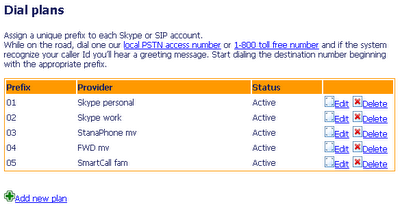 For the other contacts (that you don’t call that often) just dial a generic local PSTN access number. At this moment the service offers local PSTN access numbers in 40 countries including United States (numbers in 48 states), most western and eastern European countries, Israel and a few others from Asia and Africa. While in beta the service will be FREE for all users. After that, the service owner announced that will introduce several plans: a free one targeting individuals (ad-supported) and some commercial plans targeting mobile corporate users. The free accounts will not have the possibility to define personal local access numbers. The users of free accounts will have to dial a generic local PSTN access number or the toll free number. For more information about this service please drop me a comment. That is excellent news. I’m using a VoIP provider at my home in combination with a cheap ATA. My ATA is very basic and my VoIP provider doesn’t offer any access numbers so I can call abroad while I’m driving. This service seems like the solution to all my calling needs! How can I subscribe? Right now I’m dependent on SkypeOut to call my overseas relative. I like Skype but the fact that I have to stay in front of a computer is not very nice. I’m traveling a lot and I have to carry my laptop with me just to make SkypeOut calls. Not to mention that sometime while I’m driving I’d like to call somebody. I’d definitely like to try this service but I don’t figure out how to sign-up. P.S. I came here following a digg link. 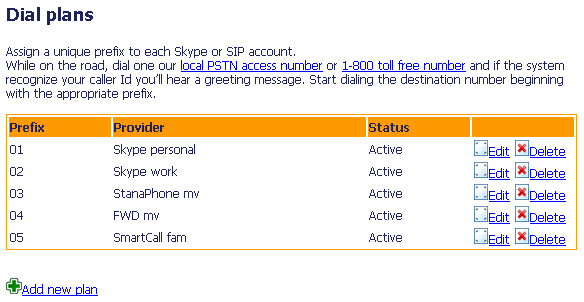 Both Skype and SIP!??! That’s awesome. 2007 will be an interesting year for VoIP. How about posting the name of the service? At this moment the service has the code name (Mobile2VoIP) and the web site is using a temporary web domain. To avoid confusion I was told not to advertise the temporary web address – this will most probably change after the beta. To obtain a free account as a beta tester you need an invitation. I’ve managed to obtain a bunch of invitations and I’m gone post them on this blog in the next couple of days. Drop me a line if you really want an invitation or you want to invest in this service. No…. this is not VoXaLot although there are some similarities between them. Both services allow to register your own providers (VoXaLot doesn’t support Skype). Both services allow making VoIP calls using the provider you selected. The difference is that the service described in this article allows doing this by calling an access number, while VoXaLot implements this as a web activated telephony service. The advantage of using an access number is important to travelers (who may not have a data plan to web activate the call).